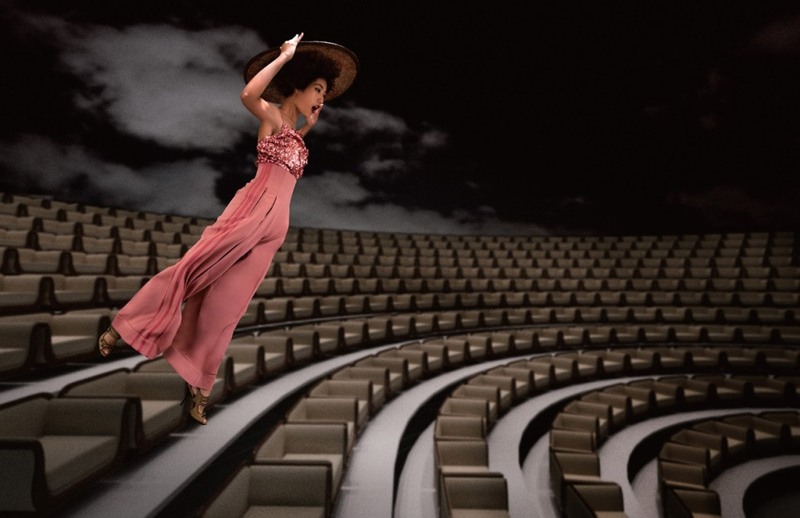 French fashion label Kenzo keeps a desert landscape for a scenic fall 2010/winter 2011 ad campaign. This time is the incredible Valley Of Fire, Utah, US captured on lens by fashion photographer Mario Sorrenti. 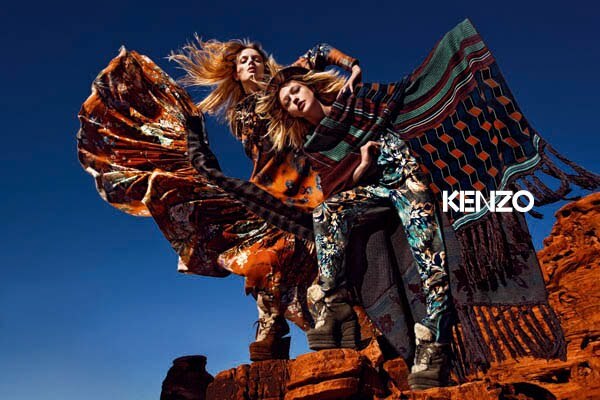 The campaign features topmodels Sasha Pivovarova, Lily Donaldson and male model Ben Hill dressed in some of the best pieces of Kenzo's bohemian fall 2010/winter 2011 collection. Boot Camp is a military trend-inspired fashion editorial shot by photographer Richard Phibbs and published in Sport&Style supplement of L'Equipe French magazine. Staring male topmodels Chad White, Kerry Degman, Ryan Bertroche, Mike Derr as well as up-and-coming star Jenry B. from Request Model Management the photo editorial has a vintage - WW II history archive aura interrupted only by images of very modern looking women. 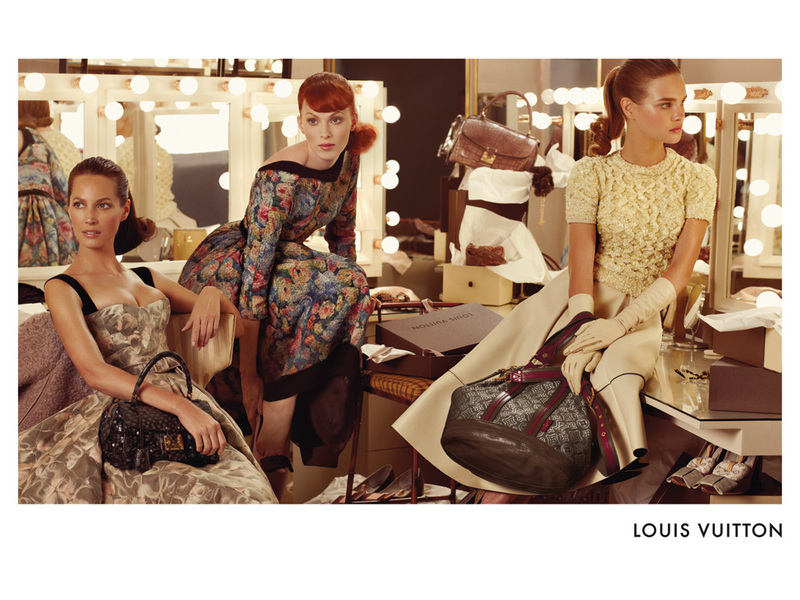 Models: Chad White, Kerry Degman, Mike Derr, Ryan Bertroche, Jenry B.
Lovely images from Louis Vuitton Fall/Winter 2010/2011 advertising campaign showing three young ladies from the upper class getting ready for a glamorous sorority gala. Putting make up, brushing their bouncy pony tails are supermodels Christy Turlington, Karen Elson and Natalia Vodianova dressed in 50s style gowns, short blouses and full skirts. Bow adorned shoes and shiny handbags are lying around. Vibrant wardrobe for the modern nomad: Sudan born topmodel Alek Wek stars in a summery, globe-trotter inspired editorial featured in Financial Times's fashion issue How To Spend It. 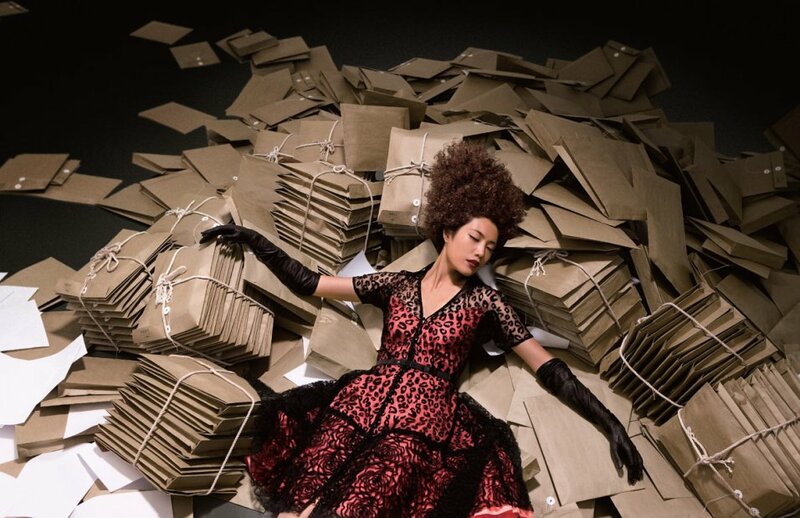 Shot by photographer Andrew Yee and styled by Damian Foxe "Global Gathering" looks like a colorful set of postcards; the mix of prints, patterns and textures from all around the world are a true feast for the eyes. Now this is an elaborate fashion lookbook: Byron Lars Beauty Mark spring/summer 2010. This contemporary womenswear line is best known for its chic cotton + lycra white shirts and the fresh, feminine-with-a-twist take on American classics. The advertising of his clothes have a quirky mood, an ironic and futuristic approach thanks to the 3D generated setting. Spring/Summer 2010 Beauty Mark catalog features model Yin Hui under the lens and artistic direction of photographer Noah Chen. The streets of Rio de Janeiro in a sticky hot day and a sailor looking for trouble. I know you can't control yourself any longer, published in Hercules magazine is a summer fashion editorial shot by Italian fashion photographer Giampaolo Sgura and starring Brazilian male model Evandro Soldati. Fashion editor Francesco Sourigues manages to create a timeless bad boy look with summer 2010 sailor inspired trends in menswear fashion. Great looking ad campaign from Prada for the upcoming season of fall 2010 starring model muse Angela Lindvall who plays the jazz singer role with heart (watch her singing Fever on prada.com). The Mad Men inspired images send forth a refined seductive mood picturing a flirtatious night out at this exclusive "early 1960s" jazz club. Makes me want to go and find a printed A-line dress and a little swing jacket right now. Models: Angela Lindvall, Miranda Kerr, Daria Strokous, Sigrid Agren, Valerija Kelava, Mark Cox, Mathias Berrgh, Clement Chabernaud and Kim Dall Armi. 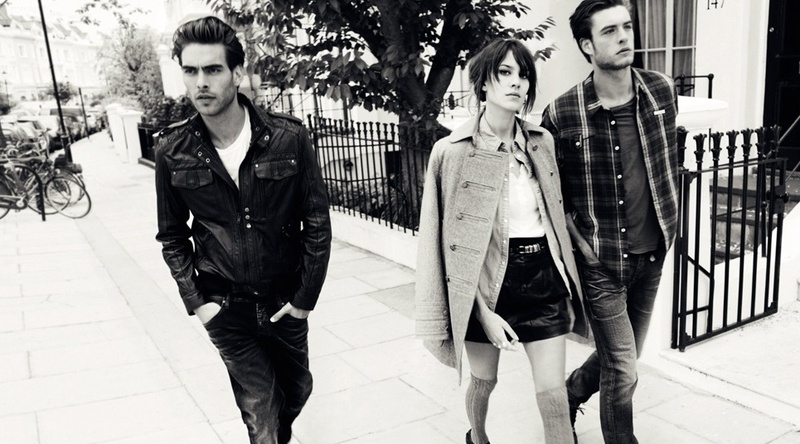 British Tv presenter and fashion It girl Alexa Chung along with Spanish sensation Jon Kortajarena and French model Gaspard Menier star in the fall/winter 2010/2011 ad campaign of the European casual wear brand Pepe Jeans London. I like the unfussy downtown setting and the "two boys, one girl" story. Ah, romantic rivalry! Polish fashion brand Wolczanka manufacturing men's shirts and accessories sends in the spot light the classic white shirt for their Spring/Summer 2010 ad campaign. Shot by photography duo Zuza Krajewska and Bartek Wieczorek and starring Polish models Jarek Pietka, Borys Starosz and Terrence from Model Plus as the wiser, mature man in white shirt, the campaign focuses on the male bonding idea. German high end fashion retail brand Breuninger signed up American top model-turned-actor Noah Mills to star in their spring/summer 2010 formalwear catalogue. Noah is playing a well dressed, honest and handsome D.A. The stylish lookbook inspired by Law & Order and TV shows alike is shot by German fashion photographer Tim Petersen. The va-va-voom lingerie photo feature (with a very blunt title) published in Spanish Vogue in June 2010 puts Brazilian alluring beauty Adriana Lima in a very retro and dramatic light. This enticing photoshoot signed by fashion photographer Vincent Peters brings to mind glamorous screen divas of the 50s, brunette bombshells like Sophia Loren, Gina Lolobrigida and Ava Gardner. And since only an alpha male could stand next to a femme fatale, Adriana's husband, basketball hero Marko Jaric joins her in the shoot. Dolce and Gabbana ads always look like these star-studded movies with no complicated plots but with many familiar and glamorous faces. Both womenswear and menswear fall/winter 2009/2010 ad campaigns were shot by fashion photographer Steven Klein. Jennifer Connelly is one of my favorite actresses, so charismatic with her refined beauty and intelligent aura while Steven Meisel is at the top of the fashion photographers list for the retro vibe of his imagery and the ability to tell an interesting story. While Balenciaga isn't quite my fashion fantasy, I appreciate its avant-garde creativity.